To learn how to get the most from your content, I interview Jason Miller. In this episode I interview Jason Miller, the senior manager of content and social at LinkedIn Marketing Solutions. He’s the author of Welcome to the Funnel: Proven Tactics to Turn Your Social and Content Marketing Up to 11. Jason is also an excellent photographer specializing in rock bands. Jason focuses on creating sharable content that also generates leads. You’ll discover how content ties into influencer relationships and how to leverage it. 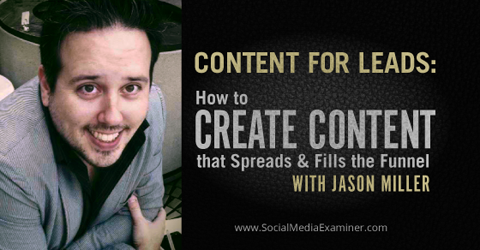 Listen as Jason Miller shares how to create content that spreads and fills the funnel. Jason worked in the music industry before he decided to reinvent himself in the social space. He tried to bring social to his music label, but they weren’t interested. So Jason quit, went back to school for training in SEO and digital marketing. He worked at a little startup called Market Tools, then Marketo and he’s now at LinkedIn. Welcome to the Funnel by Jason Miller. Jason talks about his time at Marketo. He led global and content marketing and did the blog and the social channels himself when he first started. It was chaos, he recalls. Jason learned very quickly how to solve other marketers’ problems and write about them, which is how he grew his blogging skills. For example, if someone said to Jason that social media doesn’t work in B2B, he would do the exact opposite and prove them wrong. After a tremendous amount of trial and error to find out what worked and scaling his content efforts, Jason was successful. Listen to the show to hear the backstory for Welcome to the Funnel. Jason believes it’s essential to include influencers in your marketing strategy, especially in your content. When you first start building your presence, seek out thought leaders in the space. Figure out how to take their wisdom and feature it in your content. You’ll add third-party validation and keep from talking too much about yourself. At the same time, you also get on their radar. They know you’re helping them spread the word and eventually you can find mutual benefit. Listen to the show to learn how going to conferences helped Jason get into guest blogging. Jason believes we don’t need more content, we need more relevant content. He has a concept he started at Marketo and brought over to LinkedIn called, “The Big Rock.” Basically you need to ask yourself what conversation you want to own, and then write the book on it. Jason suggests going from thinking like a publisher to actually publishing like a publisher. When Jason first got to LinkedIn, the question was, “How do I market on LinkedIn successfully?” Since the conversation was being owned by others, Jason decided to take it back. He wrote a 65-page book called The Sophisticated Marketer’s Guide to LinkedIn. It was everything you wanted to know about marketing on LinkedIn, written very strategically. Jason’s “big rock” was The Sophisticated Marketer’s Guide to LinkedIn. It was broad-reaching content gated for the purpose of collecting email addresses. It was great for lead generation, bringing people into the funnel, helping out fellow marketers and getting the word out. According to Jason, Doug Kessler of Velocity says you need one home run per quarter. The book was their big rock/home run piece of content. Your big rock can be a 65-page book (or even a 5- to 10-page ebook) on whatever conversation you want to own, he says. The next step is to take the big rock and cut it down into small pieces of ungated content. Jason calls these “turkey slices.” It’s based on Rebecca Lieb’s turkey analogy for how to repurpose your content. Out of their one big rock piece of content (the Marketer’s Guide), they got 50 or 60 different assets: 3 webinars, 2 infographics, 2 SlideShare decks, about 15 blog posts and so on. All of the ungated assets lead back to the form and the big rock piece of content. Listen to the show to discover how Jason created his 65-page ebook so you can adapt the process for your needs. Jason shares a few cool content campaign ideas. Marketo’s Big Marketing Activity Coloring Book is an activity book. Color in Seth Godin or Brian Solis, do a funnel maze, play with “dress up a marketer” cutouts and more. Marketo’s Big Marketing Activity Coloring Book was designed to make marketing fun. Jason says the idea came from the Foo Fighters’ backstage rider, which was released on The Smoking Gun a couple of years ago. Instead of faxing over a list of demands for their backstage needs, Dave Grohl put together an illustrated activity book for the people at each venue. 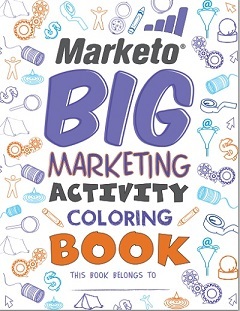 In addition to being available for download, Marketo printed out a physical version of the Big Marketing Activity Coloring Book, which they sent to people it featured and gave away at conferences. Jason also talks about using SlideShare to transform content. At Marketo, they took a whitepaper that had 18,000 views and turned it into a self-guided visual journey. They put it on SlideShare and it got 350,000 views in 6 months. It was the same content, just packaged differently. Jason says to use SlideShare, take pure text and put it into a visual presentation. He calls it “self-guided,” because SlideShare is rich media. You just click through, slide by slide, and tell a beautiful story with nice visuals. Since people like to consume content in different ways, optimize and format it to meet their needs, so you don’t miss an opportunity. Jason adds that people search SlideShare for questions and inspiration, so those who are serious about their strategy should put their content there. Listen to the show to hear more about SlideShare, including how to use lead forms. Although you can tag influencers in posts, Jason feels what works best is to just email or call them. Tell them you just released your ebook and thanks for the contribution. Then include a couple of sample updates, an abstract and some tweets. Make it as easy as possible for influencers to share, since they’re very busy. They like to share good content, and the fact that they’re included should entice them even more. Another way to make it easy is to add social sharing within the content, as we did for our 2014 Social Media Marketing Industry Report. Listen to the show to discover how to add social share buttons within your content. INBOX PAUSE is a really cool service that puts a big pause button on your Gmail. It stops all emails from coming in. If you want, set an auto-responder that tells people your Gmail is on pause and you’ll get back to them when you unpause. Use it to turn your Gmail off on the weekend, on vacation or for whatever reason. Thanks to Ray Edwards for the tip. Listen to the show to learn more and let us know how Inbox Pause works for you. 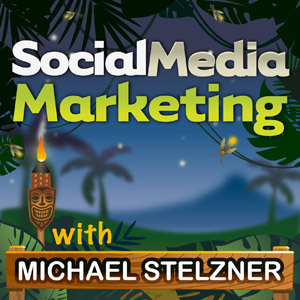 As of this recording, we are one week away from Social Media Marketing World. It may be too late for you to attend, but if you’re in Southern California, come down and check it out. For those who can’t attend the event in person, we have a virtual ticket option. If you go to the website and click on the ad that says “Can’t travel?”, you’ll discover how to access all 100+ recorded sessions and consume that content over the course of a year. You can also join exclusive networking in our private LinkedIn group. Social Media Marketing World has more than 100 other sessions, and 12 simultaneous tracks. Since you can’t possibly be at all of the sessions at once, we’ll include recordings for everyone who attends or has a virtual ticket. Visit here to check out the speakers, the agenda and grab your early bird discount. Connect with Jason on his website. Follow Jason on Twitter and connect on LinkedIn. 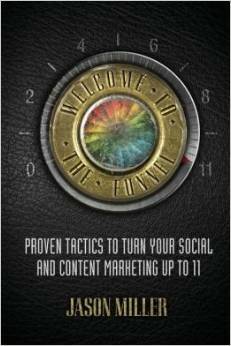 Read his book, Welcome to the Funnel: Proven Tactics to Turn Your Social and Content Marketing Up to 11. Get The Sophisticated Marketer’s Guide to LinkedIn. Learn more about Doug Kessler’s home-run content philosophy and Rebecca Lieb’s turkey analogy. Check out Marketo’s Big Marketing Activity Coloring Book. Read the Foo Fighters’ backstage rider on The Smoking Gun. What do you think? What are your thoughts on content marketing? Please leave your comments below.